The Russian Defence Ministry says Tuesday’s strikes targeted the Islamic State and other militant groups. 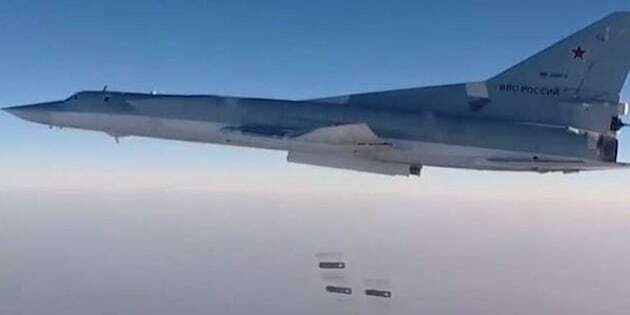 A Tupolev Tu-22M3 long-range bomber carries out airstrikes against Islamic State targets in the city of Dayr al-Zawr, eastern Syria, using high-explosive fragmentation weapons. MOSCOW, Aug 16 (Reuters) - Russia used Iran as a base from which to launch air strikes against Syrian militants for the first time on Tuesday, widening its air campaign in Syria and deepening its involvement in the Middle East. Residents inspect their damaged homes after an airstrike on the rebel-held Old Aleppo, Syria August 15, 2016. The head of Iran’s National Security Council was quoted by state news agency IRNA as saying Tehran and Moscow were now sharing facilities to fight against terrorism, calling their cooperation strategic. Both countries back Assad, and Russia, after a delay, has supplied Iran with its S-300 missile air defense system, evidence of a growing partnership between the pair that has helped turn the tide in Syria’s civil war and is testing U.S. influence in the Middle East. People inspect the area after warcrafts belonging to Syrian and Russian army hit the residential area at Tarik al-Bab neighborhood of Aleppo, Syria on August 16, 2016. The ministry said Tuesday’s strikes had targeted Islamic State as well as militants previously known as the Nusra Front in the Aleppo, Idlib and Deir al Zour provinces. It said its Iranian-based bombers had been escorted by fighter jets based at Russia’s Hmeymim air base in Syria’s Latakia Province. Debris of a building is seen after warcrafts belonging to Syrian and Russian army hit the residential area at Tarik al-Bab neighborhood of Aleppo, Syria on August 16, 2016. Aleppo, Syria’s largest city before the war, is divided into rebel and government-held zones. The government aims to capture full control of it, which would be its biggest victory of the five year conflict. Russia’s state-backed Rossiya 24 channel earlier on Tuesday broadcast uncaptioned images of at least three Russian Tupolev-22M3 bombers and a Russian military transport plane inside Iran. The channel said the Iranian deployment would allow the Russian air force to cut flight times by 60 percent. The Tupolev-22M3 bombers, which before Tuesday had conducted strikes on Syria from their home bases in southern Russia, were too large to be accommodated at Russia’s own air base inside Syria, Russian media reported.